Fill out the application below to become a member (new or renewing) with the Three Lakes Area Chamber of Commerce. 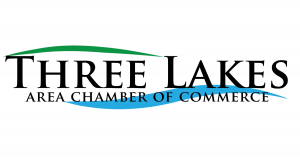 If you have any questions, please contact the chamber office at (715) 546-3344 or info@threelakes.com. After completing this form, you will be given the opportunity to pay your dues online. If you prefer to pay by check after completing the application, please mail it to Three Lakes Area Chamber of Commerce PO Box 268 Three Lakes, WI 54562.